Up until 2015, Spotify was the ultimate music streaming platform with a massive amount of subscribers (both free and premium), and a likewise extensive music library with dozens of millions of songs of every genre imaginable. But all of that change with the sudden rrival of Apple Music, not only because it started with a bigger repertoire of songs (approximately 10 million more), but because it’s backed up by the titan of all titans, Apple Inc.
Indisputably, both services are above average when it comes to music streaming, not for nothing being the top contenders in their field, but sometimes the little, sometimes overlooked, details are what may tip the scale one way or the other. Thus, with this analysis, we break down the pros and cons, within various aspects, of each service for you to decide by yourself which platform is the best. Both music streaming platforms boast exceedingly vast song catalogs, with Apple Music easily winning by a long stretch. 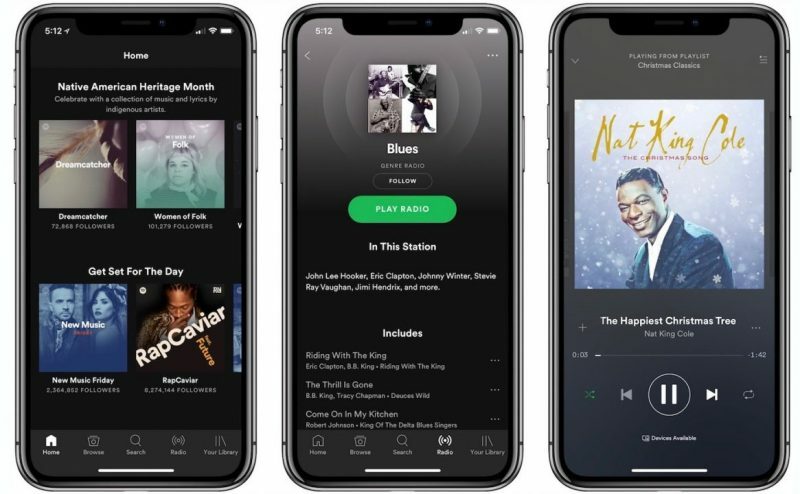 Apple Music has a library of 45 million songs, while Spotify is short 10 million, with 35 million songs in its pocket; this is not to say that Spotify’s library is by any means small, in fact, even at 35 million, it’s much more music than one person can listen to in a lifetime. Nevertheless, in the spirit of competition, Spotify adds 20,000 new songs every day. In terms of exclusivity deals, neither gets a fair share of major exclusives. Instead, most of the biggest albums are already available in both platforms a short time after their releases. One useful thing that only Apple Music has is its music integration system. With this feature users have the option of migrating content from their iTunes library to their Apple Music library, giving them free reign to browse their own music along with the Apple Music library. Regarding opportunities to find new and interesting music, Spotify definitely takes the lead, mainly because they offer an array of options and playlists for users to get acquainted with music similar to what they have previously listened to, and they’ll probably like. Spotify generates a lot of playlists with customized content, but only three are the most popular among the rest, mainly because of their accuracy when recommending new music: Release Radar, which features newly-released music from artists users listen to; Daily Mixes, a weekly collection of 30-song mixes including songs and artists that suers are already familiar with; Discover Weekly, by far the most accurate and spot-on of them all, also a 30-song playlist that gets an update every Monday and introduces users to music they haven’t heard yet, but they will most likely love. Likewise, Apple has its own set of personalized playlists, but they aren’t nearly as good or spot-on as Spotify’s. However, Apple Music features its own radio station, and a pretty good one at that, called Beats 1. Its purpose is to serve as a channel to debut new music and artists through a 24/7 transmission, with DJ Zane Lowe as the show’s regular, Q-Tip’s Abstract Radio segment, and even Pharrell’s own OtherTone show. 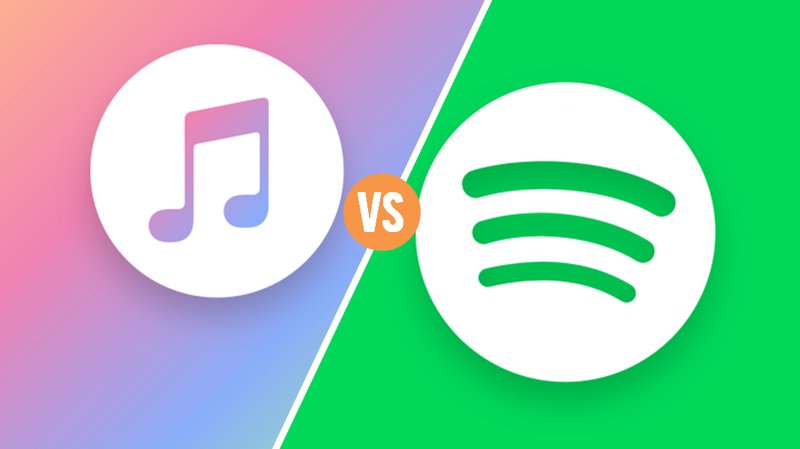 When it comes to UI design, there are no winners between Spotify and Apple Music, both have very sleek aesthetics composed of a well-thought and eye-catching palette of colors (white and pink for Apple Music, black and green for Spotify). 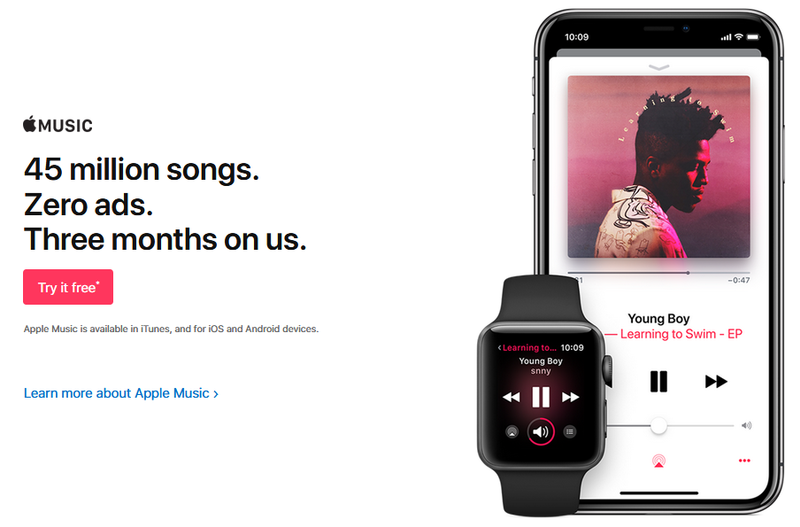 Apple Music’s main trait relies on its bright colors, big pictures, and bold fonts used in the text; unfortunately, the use of such pig pieces of imagery only makes for a great experience when used with PCs, laptops or tablets, and not so much for mobile users, making their displays look rather stuffy. 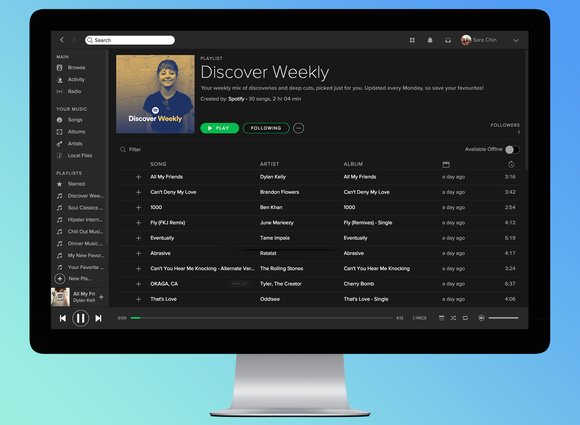 On the other end of the spectrum, Spotify has a darker approach in its aesthetics, giving it its well-known feeling of elegance and sleekness, which Spotify’s developers have been tweaking and improving over the years, achieving a consistent user experience in all available devices. User interface wise, Apple Music and Spotify have proved to be very user-friendly and intuitive when it comes to the content advertised. They both display almost identical menus, with a library, recommended music, browse, radio, and search options placed in a horizontal stripe at the bottom of the screen. One aspect, though, that seems to place Apple Music slightly above Spotify is how they both display their “saved” songs: whereas Apple Music’s “Artist” section organizes them by album, Spotify just makes a playlist of sorts with all of the songs “saved” from that artist, making it a bit messy for some. In the social aspect the two platforms offer ways for users to connect and interact with each other. Spotify’s social features allow subscribers to follow friends, see what they’ve recently listened to, or what they’re listening to in real time, share and recommend playlists to friends, and their newest one, they can publish playlists via Facebook and Instagram stories, which is very cool. 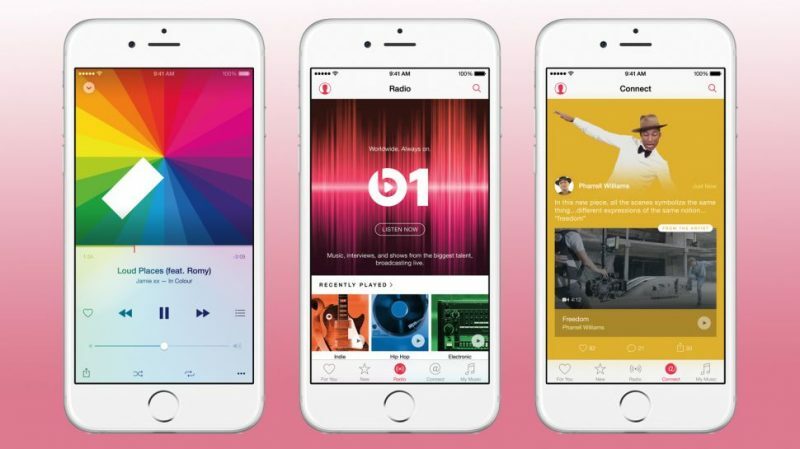 While Apple Music also lets users see what other have been listening to recently, as well as public playlists, their real social asset is their feature Connect, a way for artists to virtually get in touch with fans, where there’s access to new singles, videos and messages. 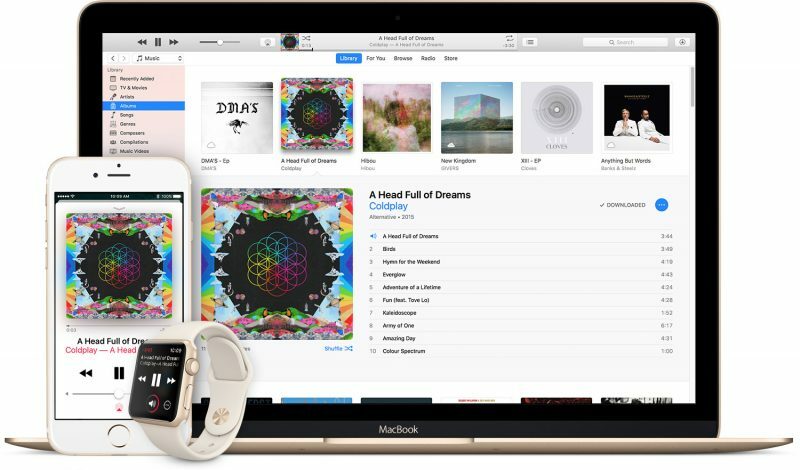 Apple Music falls short in terms of device compatibility, only being available for Apple devices (iOS, and MacOS, PCs, and Android devices. US$9.99 per month for the Premium plan. US$4.99 per month for the Student Discount plan (Now with Hulu). US$14.99 per month for the Premium for Family plan (that covers up to 5 people). US$9.99 per month per user. US$14.99 per month for the Family plan (that covers up to 6 people). US$4.99 per month for the Student Membership plan. US$8.33 per month for the annual plan. 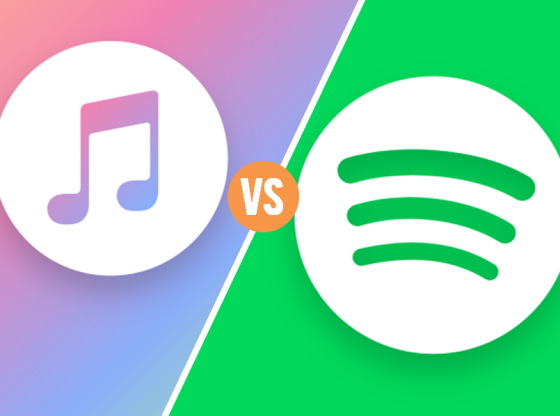 Bottom line, both music streaming platforms offer very neat features to please average and picky subscribers, with one out-doing the other in some aspects, but overall the scale is very balanced. People that rely heavily on Apple products will probably find in Apple Music everything they need without too much hustle. On the other hand, Spotify offers a free service (with ads) and a much better selection and recommendation of new music. At the end of the day neither platform outshines the other too much, leaving the choosing of which services to use entirely to each user’s personal tastes, rather than how well thy perform, precisely because they offer an excellent service.